It’s the “largest and longest annual gathering in the history of the United States,” according to Conservapedia (an online encyclopedia). Each year, after a noon rally on Washington, DC’s National Mall, hundreds of thousands of people—most in their teens and twenties—march from the mall up Constitution Avenue and then to the Supreme Court building on Capitol Hill. Major downtown streets are closed from 9:30 a.m. to 6 p.m.—almost five hours after the event is scheduled to start. And the city’s population swells considerably for a few days. The college students who participate in the March for Life are also activists on their campuses’ intellectual and cultural fronts. Sins against life and human dignity are grossly underreported and misrepresented by mass media. Many people are “pro-choice” based on legality and misconceptions about what is actually involved in abortion and euthanasia. This is true on college campuses as well. St. Gregory’s University junior Gabriela Weigel said, “Right now, we prepare ourselves because that’s what college is: preparing yourself. It is the most opportune time to prepare yourself for the pro-life movement. It’s a perfect place to engage with people in conversation.” Understanding and being able to explain the pro-life position is an invaluable tool for changing the way people view the sanctity of life. The March for Life sees many of the same faces every year. Many of these participants grew up with the march, and the pro-life cause is an integral part of their lives. “When I was younger, I knew the march was important, but I didn’t understand it well,” said 18-year-old Hannah Whitman, a native of New Jersey. She has marched with her family every year since age six. 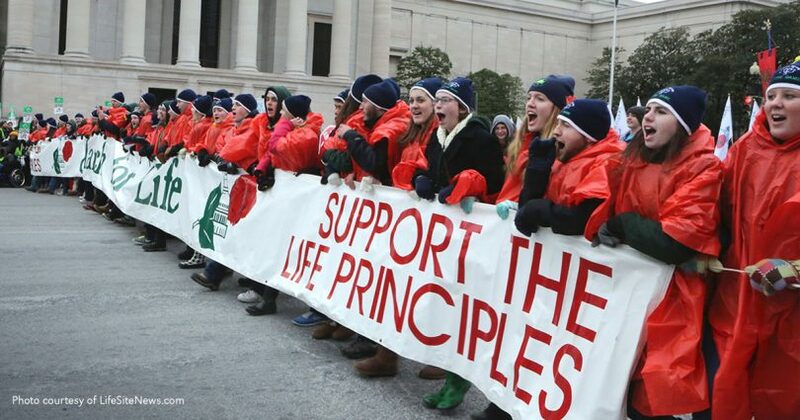 The March for Life is not a stand-alone event. It reflects a massive nationwide movement, and it’s the culmination of grassroots pro-life activism. So, how can pro-life college students be activists on campus? 1. Education: The first step in promoting the pro-life message is educating yourself so that you know what your message means. The next step is to promote it: Set up informative displays on campus, participate in national events such as the Pro-Life Day of Silent Solidarity, host a speaker, or ask your group to wear pro-life T-shirts on a designated day each week. 3. Ministry: Ultimately, the pro-life movement is about ministering to those threatened or affected by abortion and other attacks on the right to life. Campus pro-life groups can sponsor sidewalk counselor training or host a baby shower for a local pregnancy center. The group as a whole or its individual members can also reach out to women and men on college campuses who are suffering from post-abortion trauma. 4. Community: By developing a strong community both within your pro-life group and across campus, you create a support system so that those who need help or have questions know where to turn. 5. Career choice: “You can be involved in the pro-life movement in any way, shape or form,” said Gabriela (see main article). “Through the career choices that you make, . . . you can always find a way to impact someone.” As you choose and prepare for a career, think of the avenues it might offer to spread the pro-life message. Lauren E. Mach is from North Texas and is currently a sophomore at St. Gregory’s University in Shawnee, Oklahoma. She is majoring in philosophy, communication, and psychology, and also serves as events chair for the SGU Pro-Life Team. Lauren won first place in American Life League’s National Pro-Life T-Shirt essay competition last year (see “How to Reverse the Culture of Death” in our July-August 2012 issue). She has attended the March for Life three times, including this year’s march.